EnergyCAP Cost Avoidance methodology and core calculations date back to 1982, when EnergyCAP’s predecessor (FASER Energy Accounting) first introduced Cost Avoidance. Members of the pioneering team of software engineers and developers who introduced Cost Avoidance are still refining and enhancing EnergyCAP today. Over the years, these principles have served the needs of thousands of energy managers and assessed billions of dollars in energy management projects. EnergyCAP calculates the savings attributable to energy management by comparing current bills with a normalized baseline year. The normalization process automatically accounts for major variables, including weather (degree days), billing period length, floor area changes, and commodity price, and allows the analyst to enter adjustments for other changes such as occupancy, schedule, and equipment retrofits. 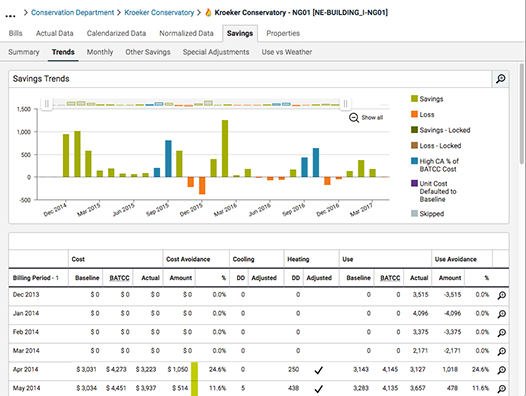 This enables you to compare energy use and cost from year to year to get accurate savings data.